The Sherwood Planning Commission and Landmarks Advisory Board recently approved a new three-story commercial and residential project at the corner of Southwest Second Street and Southwest Pine Street in the Historic Old Town area better known as Smockville. 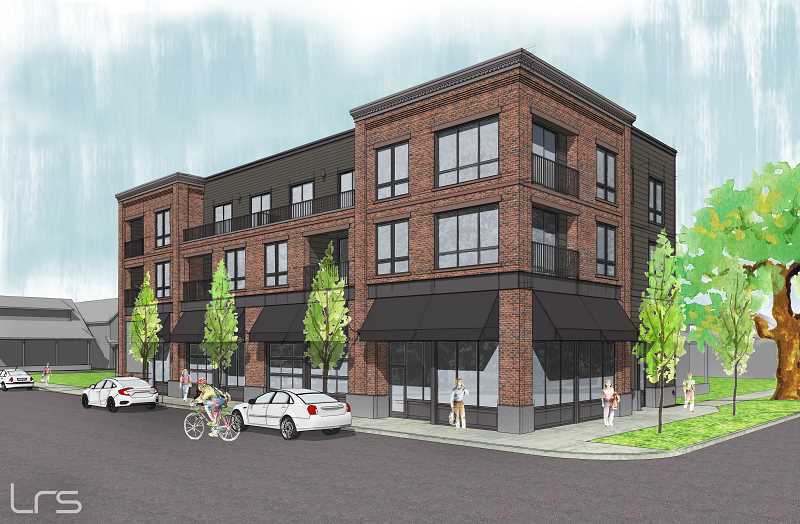 Planned to meet Sherwood Old Town design guidelines, the building will have 5,000 square feet of ground floor commercial space with seven one-, two- and three-bedroom residential apartment units above. A yet-to-be named, locally-owned pizzeria, will be the anchor tenant for the property. "The city wants to create a vibrant, mixed-use downtown with increased pedestrian activity and transit opportunities," said Ben Riemer of LRS Architects, the project's design architect. "This building speaks to those desires while also maintaining the traditional character of the pre-World War II streetscape." Derrick Kitts, of AJK Investments LLC, is the developer of the site. "The construction and design will make all the people of Sherwood proud," said Kitts. After moving to Sherwood from Wilsonville, Kitts noticed there wasn't a place for children to congregate after big games or for birthday parties and wanted to change that. The planned design for the pizzeria includes a loft for team parties and private events. "It is our belief this building will provide much needed living space and a wonderful new addition to the Old Town food scene," said Kitts. The approved project design incorporates a variety of natural and subdued building materials, including finished concrete, brick and lap siding. Traditional canvas awnings, a signature Sherwood design feature, combine with horizontal brick banding, corbelled brick courses and an ornamental cornice to create a façade with Smockville character.